There are several variations of the apple cider vinegar diet but most of them simply include adding 1-2 tablespoons of apple cider vinegar diluted into water before eating, in addition to consuming a healthy diet. Nutrition professionals state that it helps improve digestion and gut health, while reducing appetite to promote weight loss. Apple cider vinegar is known for its being alkaline and reducing inflammation in the body. There is not enough research to declare that it can cause weight loss but research does show that those who consume it prior to meals tend to eat less calories overall and they have a reduced fasting glucose levels. This shows that it may cause weight loss, it can support your healthy lifestyle efforts to lose weight and obtain better health overall. Anyone can try this diet, because it is more of a supplement to healthy eating. If you are on medications that have food interactions contact your doctor and try it under their supervision. Vinegar should be diluted. Its high acidity can damage tooth enamel when sipped “straight” — consuming it as a component of vinaigrette salad dressing is a better way. It has been reported to cause or worsen low potassium levels. That’s particularly important for people taking medications that can lower potassium (such as common diuretics taken to treat high blood pressure). Vinegar can alter insulin levels. People with diabetes should be particularly cautious about a high vinegar diet. If they start to have diabetic lows (symptoms include, inability to think clearly, lightheadedness, chest pain, shaking or tremors, and sweating) they should talk to their doctor about altering medication levels. Health success can be measured in how you feel, more energy, less, pain, or weight loss, decreased cravings, and improved appearance of hair, skin and nails. You should be eating healthy balanced meals that include anti inflammatory/heart healthy fats, quality protein and an abundance of vegetables and some fruits. In addition to whole unprocessed foods aim to consume at least half of your body weight in ounces of plain alkaline hydroxide water daily. My favorite brand is AQUA-OH! because it actually removes acid from the body. This water actually removes the acid from the body instead of just buffering it like other alkaline waters. It does this by the OH- from the water combining with H+ from the body (H+ causes acidity) and forming water. This helps drastically reducing inflammation (caused by acidity), clears the detoxification pathways helping detoxification, and ultra hydrates by producing more water than you drink. This diet works best with whole unprocessed foods in their most natural form. Avoid processed foods out of a can, bag, box or anything with preservatives. 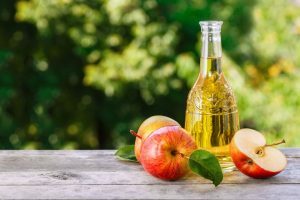 Why or why not is Apple Cider Vinegar good for weight loss? It should be viewed as a supplement to a healthy lifestyle that supports weight loss efforts rather than causing weight loss.